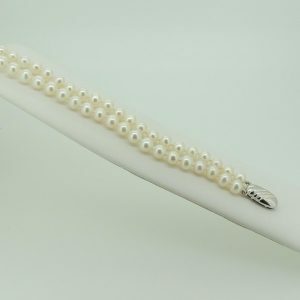 The two strands of cultured freshwater 6-6.5 mm pearls give a very rich look to this classic bracelet. The sterling silver clasp finishes off this very stylish bracelet. 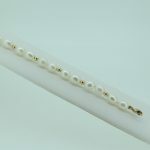 The knots between each pearl mean that this bracelet will not bunch or get tangled but will lie smoothly on a wrist.